A long time ago, on a balmy spring evening in 1986, I was in graduate school and did not feel like doing my homework. So I rebelled, for just one evening. In my case this meant simply reading a book that I found in the theological library. 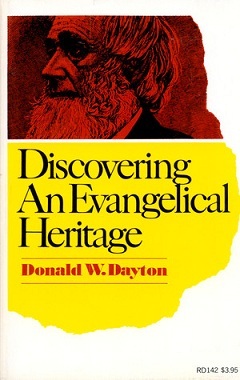 The book bears the title, Discovering an Evangelical Heritage, by Dr. Donald W. Dayton. My act of rebellion was hiding away in the basement of Speer Library at Princeton Theological Seminary, reading Dr. Dayton’s book in one sitting. I know – real daring. Why this book? Well, it is a book that explores a movement in American religious history before the Civil War. Most importantly, the picture on the cover is of Adrian College’s first president, Asa Mahan. There I sat, at an Ivy League graduate school, reading a noted text with the picture of Adrian College’s first president gracing the cover. I promised that if I ever came back to Adrian, I would make sure students learned about President Mahan. Those of you who know me will probably admit that I have kept my promise. Professor Dayton’s now-established thesis argues that Evangelical Christianity led much of the pre-Civil War movement to end slavery, to care for the poor, and to treat women and men equally. Because Dr. Dayton was from a religious community that called itself “Evangelical,” he wondered how things had gone wrong over the years – how his movement had become so narrow by the late-twentieth century. I wondered the same, and Asa Mahan’s life became a resource for that wondering. I consider myself to be an Evangelical Christian – a descriptor that is very much contested these days. Yet I also confess to feeling more comfortable with the kind of Evangelicalism that cares about equality, justice, and the dignity of people. There is such a thing, or at least there was such a thing. So I suppose I often feel more a part of the nineteenth century than I do our current era. Or maybe I feel more a part of the future vision of love and justice than I do our current era. The movement led by President Mahan was unabashedly convinced that God wants the best for humanity, all members of humanity. Mahan was particularly drawn to philosophy and especially those philosophers who tried to highlight human dignity and worth. For instance, he gravitated toward the German philosopher Immanuel Kant. It is not trendy today to celebrate much of anything about Immanuel Kant, but I have never worried much about being trendy. When you live in the past and the future at the same time, you embrace eccentric thought patterns. Immanuel Kant was known for his Categorical Imperative. His theory of ethics suggested many ways to explain the Imperative. One of the ways was to emphasize that people are ends in themselves and not means to someone else’s ends. I know – very theoretical stuff. But look at it this way. If you have ever been “used” before, you know what it is like to be considered a means, a mere tool, an instrument for someone else’s wants. Not cool. On the other hand, if you are treated as an end in yourself, you are encouraged, challenged, affirmed, heard, and loved. President Mahan saw many connections between the love commandment of Jesus and the ethic of Immanuel Kant. In fact, President Mahan was so enamored with Kant’s ethic that he saw the wider social fabric as a community of people who were ends in themselves. This was called the Kingdom or Realm of Ends by Immanuel Kant. 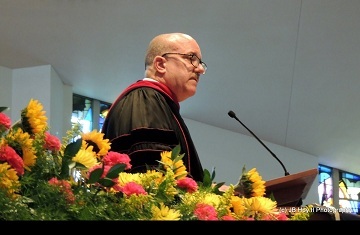 Graduates, you have reached the “end” of college, but you are still and perhaps now more than ever members of a “community of ends.” That is, you are called out and into a wider social world where you can treat each and every person with love and justice. Government, to answer its ends, must be the citadel of liberty to all its subjects & render each & all free & equal in the enjoyment of life, liberty, and the pursuit of happiness. This I find to be a compelling statement. Yet there is one word here that has bothered me. It is the word “subject.” We don’t like to think of ourselves as “subjects.” That seems to be the kind of status reserved for those under the power of a king or queen. No, we like to be citizens. But I’ve concluded that old Dr. Mahan was pulling our leg a bit and employing philosophical language here. A subject in philosophy is a being with dignity, with dreams, with unique value, with initiative – and perhaps most of all – with voice. Class of 2017, you possess a voice of inestimable value, but you are also called to hear others. That is what it means to be part of the community of ends. And I would add, that is what it means to love. The most important vocation you will ever be given is that of loving with all your being. God bless you, go with you, and give you the strength to love.